Public opinion on budget matters is largely reactive and relatively unformed: Asking voters about the most important problems facing the state generally reveals how few focus on the particulars of the budget, to say nothing of the procedural details of the process. Ask them about priorities, and they use broad impulses on taxing-and-spending heavily associated with party affiliation to fill in the blanks. So it is all the more surprising, perhaps even a little heartening, to see that the terms of the budget debate appear to have — at least broadly — matched the currents in public opinion as the final, volatile stages of the budget process play out. One might expect public opinion to shape budget policy, but good reasons exist for expecting only tenuous connections between the budget and what the public thinks about it. While the law and policy produced by the Legislature affect nearly every Texan (and no small number of non-Texans, for that matter), only a fraction of the population actively participates in the legislative process in any way. The process is complex to the point of being arcane, and is only somewhat less opaque to participants than it is to the public. During the budget negotiations last week, the core debates revolved around how much money would be restored to public education and from what source; whether and how the state would fund water infrastructure needs; and how much tax relief would be granted and to whom. Lurking in the background was the ever-present threat of a revolt by Tea Party acolytes who resist new spending, taxes and fees; drawing from the Rainy Day Fund; or exceeding the constitutional limit on spending growth. Agitation over these concerns also creates incentives, particularly in the House, for self-interested defections by mainline Republicans looking to hedge against primary challenges from the right in 2014. Even though this description of legislative budget infighting sounds as twisted as the court intrigue in Game of Thrones, the budget endgame now playing out in the Texas Legislature broadly reflects the partisan preferences of voters that were revealed in the UT/Texas Tribune Poll conducted in the early days of the current session. Concerns about state budget cuts and taxes barely dented the “most important problems facing the state” question. Pressed more directly about budget priorities on the agenda going into the session, Texans expressed fairly predictable partisan dispositions. 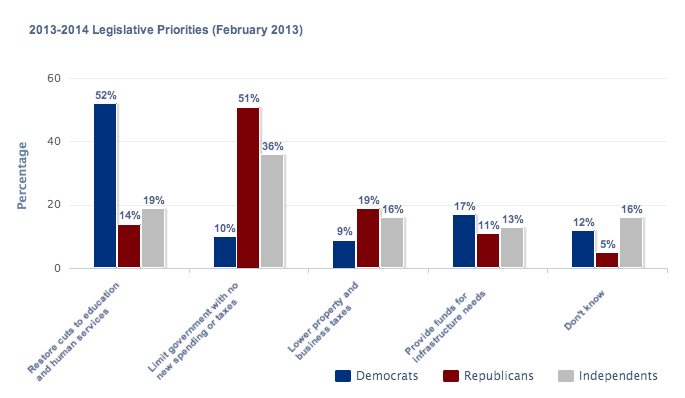 Most Democrats favored restoring the budget cuts imposed on public education during the last session, and most Republicans favored continuing to limit spending and to avoid raising taxes. The potential for Tea Party resistance to the emerging push to finance a water development fund was also telegraphed in the February poll numbers. Among Tea Party identifiers, only 8 percent called on the Legislature to prioritize funds for infrastructure needs, and only 9 percent wanted to restore funds to public education and human services — more than 10 points below non-Tea Party Republicans. 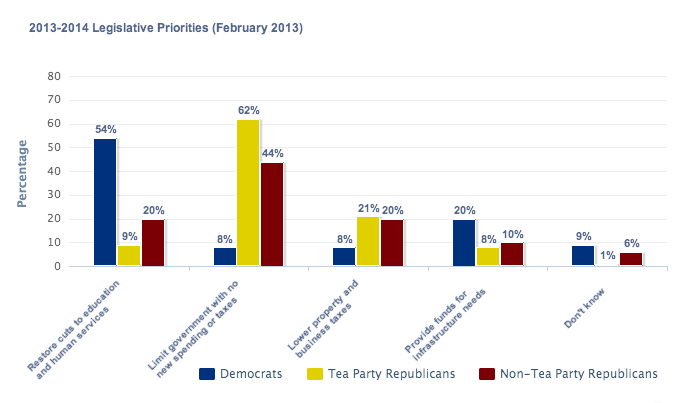 Continuing to limit government with no new spending or taxes was the priority of 62 percent of Tea Partiers. As of this writing, legislative positioning around the budget, and specifically the impact of water funding on the overall budget, reflected these divisions in public opinion to a striking extent. Becca Aaronson’s Monday table setter on the budget found House Appropriations Chair Jim Pitts, R-Waxahachie, a leader of Republican establishment forces in the House, cheerleading the financing of the water plan via SJR 1’s creation of a $2 billion fund. House Democratic Caucus Chair Yvonne Davis, D-Dallas, was still withholding full support, pending assurances on education spending. Conservatives including Jonathan Stickland, R-Bedford, and David Simpson, R-Longview, expressed concerns about the budget and the potential for “political corruptions” in the water-funding bill, respectively. The contents of the budget will not be finalized until the process is complete, but it’s a safe bet that in the end, no one will be fully satisfied — a result that accurately reflects the cross currents in public opinion given the tripartisan universe of Texas voters. This article originally appeared in The Texas Tribune at http://www.texastribune.org/2013/05/21/polling-center-budget-endgames-and-public-opinion/.